An Imperial Stout is, more often than not, defined by its grain bill. It isn’t a “hoppy” beer (though I have had some solid hoppy-RIS, like Close Encounters by Pipeworks), it isn’t required to have a specific yeast character, and while adjuncts like coffee often play a role, it typically isn’t considered a special subcategory of the style (though, if you’re submitting to a competition, consider the specialty category if the character is obvious). In the last part of the series, we examined survey data from /r/homebrewing regarding their imperial stouts. In this part of the series, we are going to examine some of that data compared to data from other award-winning homebrewers and professional brewers. When I build a new recipe, I like to start by examining clone data. Not a singular clone recipe, but looking at a whole bunch of recipes to see if there are similarities between them. Below are a few of my favorite imperial stouts on the market. If you’re a RIS fan and haven’t had some of these, I highly recommend trying them! There is one piece of information I find incredible from this chart: every single one of them splits their roasted grain. Interesting, right? Not one of these stouts only uses Chocolate malt or Roasted Barley. Also interesting that they almost all use a Chocolate/Roasted Barley combo (there are a lot of other famous Imperial Stouts that fall under that umbrella as well, including Firestone Walkers’ Parabola) with Chocolate either leading the way or meeting the level of Roasted Barley. Also interesting is the use of 2-Row rather than Maris Otter, except for Old Rasputin. This is something I’m skeptical of, if only because I’m not sure what sort of 2-row they are using. It could very well be Maris Otter, or it could be Briess 2-Row for all I know. Another common addition? Crystal malts, specifically dark ones. Flaked Oats/Barley is also common. That’s quite the list, and it shows that while there are certainly some similar trends among these grain bills, there is a lot of room for interpretation and experimentation in the style. I’m not a professional brewer, and I like to see how homebrewers are doing things as well. It’s entirely possible that in the scale of the process, there are differences in the grain bill as well. The AHA was kind enough to let me get into the grain bills for past NHC winners. These are the RIS recipes that won gold! On the AHA site, NHC records go back to 2003, meaning we have had a total of 13 National Homebrew Competitions, and a RIS has won gold in its category 7 times, over 50%. Big percentage for that category. So what does it look like homebrewers are doing? More of them are using Maris Otter than professional brewers, but quite a few are still using 2-row. And, like professional brewers, all but one of the NHC winners are splitting their roasted grain, AND like the professional brewers it is almost always a split between Chocolate/Roasted Barley. Comparatively there is also way less crystal being used by the homebrewers. It looks like there is a tendency to choose either Standard 2-Row or Maris Otter as the base malt for imperial stouts. Almost all of the recipes I see include one or the other, rarely a blend of both. On a professional scale, I was curious why so many breweries were using 2-row if Maris Otter was a “better” base malt. I guessed because it was cheaper. Yes, I legitimately thought this about stouts going into this, and I’ll own up to that. I sent some emails, and the only brewery that got back to me was the incredible Oskar Blues, the email was written by their head brewer Tim Matthews. Tim’s excellent answer was to clear up the idea that the brewery may use 2-Row for a “commercial” reason (which they don’t). The breweries Pale Ale malt is purchased in bulk, it is incorporated into a lot of their recipes, but they use other base malts for some of their other beers when necessary. Pinner is an example of this. The reason Tim gives for why they use 2-row reflects some of the answers we see from homebrewers. Looking back at the RIS survey, 60 people responded that they use 2-row as their base malt, while only 20 people said that they use Maris Otter. This seems to be consistent with the professional grain bills as well. Reasons for utilizing 2-row included that 2-row has a higher diastatic power and the bulk of the flavor for a RIS is from the Crystal and Roast malts. 2-row is the canvas, specialties are the paint. So, looking at my own recipe, this really opens up 2-row as a possibility when I hadn’t considered it such before. Am I making sure there is enough diastatic power in my mash? Do I prefer the same grain bill with 2-row versus Maris Otter, or is it an apples and oranges argument? I’m adding it to the list of things I’d like to try, and getting a solid base malt is a vital step to making better beer. On that note however, Tim’s comment also makes me think about the maltster for the base malt. In the first part of the series, I said that I was convinced one of the issues with my RIS was the use of Briess roasted malts. The survey didn’t necessarily support this, since a majority of users didn’t pay attention to the malster they used for their roasted grains. I’m still in favor of maltster making a difference, and if it matters in the grains that make up a small portion of the total grist, then I’d also assume it matters in the grain that makes up a majority. Is there a difference in a RIS made with Briess 2-row versus Rahr? Absolutely something to add to the list. On the argument of maltster, Tim Matthews mentioned in a Reddit AMA that Oskar Blues uses all Simpsons’ malts for their roasted grains. Briess Chocolate malt has a lovibond of 350º, while Simpsons Chocolate malt has a lovibond of 400º-488º. Compare this to their roasted barley, where Briess has a lovibond of 300º and Simpsons has a lovibond of 488º-700º (quite the range). Eric of Eric’s Brewing Blog pointed out this Beersmith podcast with Randy Mosher, where (at around 17:30) Mosher discusses the range of lovibonds (somewhere between 150-225) that aren’t typically used because they create unpleasant ashy and burnt characteristics. He goes on to say the darker roasted malts, like Simpsons, are actually mellower than their lower lovibond counterparts. The higher temperatures actually burn those less-pleasant characters away. Interestingly, Mosher also notes that he dislikes Chocolate malt, equating it to “old diner coffee”, but Chocolate malt is incredibly widely used in both professional and homebrew recipes. Either way, I think it is interesting that you get a different character from these roasted malts based on lovibond, and it is another thing I am adding to the experiment list. If nothing else, this validates my fear that large amounts of Briess malts may have been the culprit for some of the unpleasant characters in the beer. I think “startling” is the right word here. I didn’t expect so many of the recipes, almost all, to come to the table with a mixed presence of roasted grains, primarily Chocolate and Roasted Barley. This one I’m a little more hesitant about, but from the information so far I’m fairly convinced that maltster plays a siginifcant role in how the beer turns out. Choosing the right brand of Chocolate malt, in my opinion, can result in a very different beer. The absolutely average of the amount of roasted grain used in the grist by Professional brewers is 8.3%. If you remove Old Rasputin, that average is 10%. In the homebrew recipes, the average is 11.2%, and with all of the recipes combined the average is 10.2%. I’m not saying a great RIS can’t be made with less than 8% or more than 15% roasted malts. Obviously, since I love Old Rasputin, that just isn’t the case. What I am saying is that, as a rule of thumb, that range is a good place to start construction. Crystal is an incredibly common ingredient in these recipes, and a few of them split the crystal, usually heavier on the C120 end of the spectrum than something lighter. Personally, splitting crystal is something I’ve advocated for a while now, and in my opinion is gives you a fuller, more complex caramel character. That list earlier of grains that were only represented in one recipe was extensive. I think that shows how open the style is, and that there is room to really dial in your preferences. When looking to build a grain bill, I’m definitely going to look more at specific grains I enjoy (like Honey Malt or Special Roast) and see if they play well. 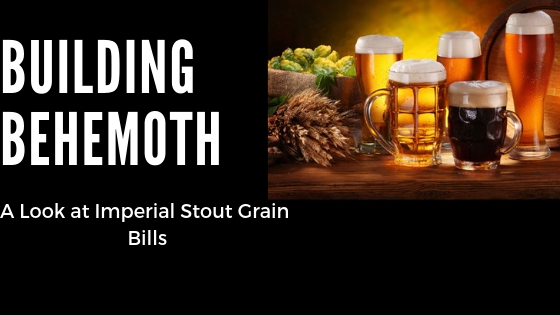 There’s more to be learned from these recipes, and a lot to be learned outside of them (regarding Imperial Stouts, that is), but these four key factors are things that I think are going to help pave the way to a better grain bill design. Let me continue beating the dead horse, this data doesn’t mean anything. It doesn’t prove that the only way to make a good RIS is with a blend of Chocolate Malt and Roasted Barley, it doesn’t prove that 2-row is a better base malt, and it certainly doesn’t represent the best practices of the community. Does a base malt of 2-row versus Maris Otter make a difference? Does the brand of 2-row (or MO) make a difference? Can a RIS made with Briess roasted malts be distinguished from a RIS with Simpsons roasted malts? And, at the end of each of these, there’s the asterisk of “Which do I prefer?”. That’s what it comes down to when building a better beer, building it to your preferences so you’re satisfied. In the next part of the series, we are going to examine hops and the hop-practices of breweries and homebrewers who make awesome imperial stout!